Instagram is one of my favorite social media outlets. I love to see pictures of people's lives and flocks. They say a picture is worth a thousand words, and that's what I get each time I visit Instagram. 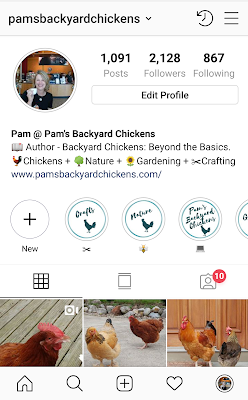 Be sure to stop by to see almost daily pictures of my flock here at Elm Ridge Farm, along with all our other animals, gardens and nature. Also, don't forget to check out my story highlights. Each Instagram page handles these differently. For me, I think these stories are a quick and fun way for you to get to know me and my flock better. I change them up regularly and think you'll enjoy them.